On a cold winter night, an old beggar woman comes upon a glorious castle belonging to a young prince. She asks the master of the castle to allow her to stay the night, away from the cold, and in return she will give him a single rose, but the prince is vain and uncaring and turns her away solely for her appearance. As he does this, she warns him not to be fooled by appearances, as true beauty lies within, only to be rejected again. Seeing his horrible heart for what it truly is, she transforms into a beautiful enchantress and turns the prince into a hideous Beast and his servants into various household objects. She gives him the rose to use as an hour-glass. The only way he can break the spell is to learn to love another and earn her love in return by the time the last petal falls. Ten years later, a beautiful young woman named Belle makes her way into town one morning in order to get a book from the local book seller. On the way she expresses her wish to live in a world like her books, full of adventure, while the townspeople note her unparalleled beauty but find her love of books odd ("Belle"). Belle has also attracted the attentions of Gaston (the local hunter and town hero) who admires her only for her beauty and not her intelligence. Belle, however, is not oblivious to her peers' views of her. She voices her concerns about it to her father, Maurice, an eccentric inventor. He assures his daughter that she is anything but strange ("No Matter What"). The two then put the finishing touches on his invention and Maurice heads off to an invention fair donning a scarf knitted for him by Belle ("No Matter What Reprise"). In the woods, Maurice becomes lost when a pack of wolves attacks him; he finds his way to a mysterious castle on the edge of the crossroads and enters. The servants of the castle include Lumiere, a maitre d' turned into a candelabra; Cogsworth, the head of household turned into a clock; Babette, a maid turned into a feather duster that still seems to retain her flirtatious tendencies; Mrs. Potts, the head of the kitchen turned into a tea pot; and Chip, the son of Mrs. Potts. They welcome him, but the horrid Beast arrives and orders Maurice to be locked away in the dungeon for trespassing. Back in town Gaston proposes to Belle, which she politely rejects ("Me"). Appalled by Gaston's forwardness, Belle once again voices her need for a life outside this provincial one ("Belle Reprise"). Gaston’s sidekick, LeFou, returns from the woods wearing the scarf Belle knitted for Maurice. Belle realizes her father is in danger and heads into the woods to look for him. She ends up at the castle where she finds her father locked away in a dungeon. She makes a deal with the Beast, Maurice goes free but she remains instead. They agree and Maurice is sent back to town without being allowed to say goodbye. Belle is given a guest room and ordered by the Beast to join him for dinner. 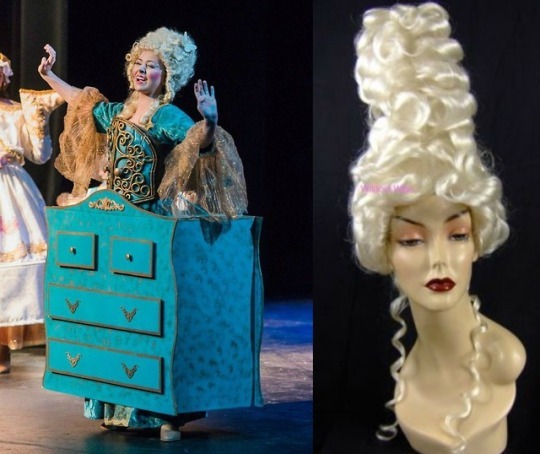 She mourns her situation ("Home"), but Mrs. Potts and Madame de la Grande Bouche, an operatic wardrobe, attempt to cheer her up ("Home Reprise"). Back in town, Gaston sulks at his loss of a bride. Lefou and the patrons attempt to cheer him up ("Gaston"), when Maurice rushes in claiming a Beast has Belle locked away; they laugh at him but Gaston formulates a plan ("Gaston Reprise"). Back at the castle, the Beast grows impatient as Belle has yet to join him for dinner. Cogsworth informs him she refuses to come, after a shouting match between Belle and the Beast (which ends in a victory for Belle) he tells her if she cannot eat with him then she will not eat at all. In his quarters, he sulks and notes his fate should the spell not break ("How Long Must This Go On?"). Eventually Belle does become hungry and ventures into the kitchen where the servants offer her dinner despite their master's orders. They treat her to an amazing cabaret show ("Be Our Guest"). After dinner, Belle gets a tour of the castle courtesy of Cogsworth and Lumiere; her curiosity leads her to enter the West Wing, a place the Beast told her was forbidden. Mesmerized by a mysterious rose floating in a bell jar, she reaches out to touch it; but before she can, the Beast stops her and orders her to get out, accidentally shoving her in the process. Appalled that he has touched her she flees the castle fearing for her life. Realizing his deadly mistake, the Beast knows he will be a monster forever, if he cannot learn to love her ("If I Can't Love Her"). In the woods, Belle is attacked by wolves and is only rescued when the Beast comes to her aid; but he is injured during the fight and collapses, and Belle helps him back to the castle instead of taking the chance to run home. She cleans his injuries and after a brief argument about whose fault it was, the Beast thanks her for her kindness and thus their friendship is born. Wanting to give her a thank-you gift, the Beast gives Belle his huge library, which excites her. She notes a change in the Beast's personality as the servants note a change in Belle and the Beast's relationship ("Something There"). They express their hope of being human once more ("Human Again") while Belle asks the Beast to accompany her to dinner that night. Back in the village, Gaston meets with the asylum owner Monsieur D'Arque. They plan to lock Maurice away to blackmail Belle into marrying Gaston ("Maison des Lunes"). In the castle, the Beast and Belle attend a lovely dinner and personal ball, where they dance together in the ballroom ("Beauty and the Beast"). After, the Beast (who plans to tell Belle he loves her) asks her if she is happy here; she responds positively but notes that she misses her father. He offers her his Magic Mirror to view him: She sees that her father is sick and lost in the woods. The Beast allows Belle to leave in order to save him; she departs after a tearful goodbye ("If I Can't Love Her Reprise"). Belle finds her father and brings him back to their house in the village. After she is able to nurse him back to health, she explains the transformation she seems to have gone through while she was with the Beast ("A Change In Me"). A mob arrives, led by Gaston to take Maurice to the asylum. Belle proves her father's sanity by showing the townspeople the Beast is real using the Magic Mirror, but doesn't realize the error in her gesture. The townspeople immediately fear the Beast, but Belle insists he's gentle and kind. Gaston catches her tone and recognizes the Beast as his rival for Belle's affections and organizes the mob to kill the Beast ("The Mob Song"). At the castle, the servants are able to keep the lynch mob at bay, but Gaston breaks through and finds the Beast in his tower. He engages in a fight with him, mercilessly beating and taunting him. The Beast has lost the will to live at Belle's departure. As Gaston moves in for the killing blow, Belle arrives. The Beast immediately turns on Gaston and is prepared to kill him, but spares his life after seeing the fear in his eyes. The Beast and Belle are reunited, but this reunion is cut short as Gaston plunges his dagger into the Beast's back. This act of violence causes Gaston to lose his footing and he falls to his death. On the balcony, Belle assures the Beast he will live, but they both know she is helpless to save him. She begs him not to leave her because she has found home in his company ("Home Reprise"), but despite this, he dies; Belle sobs on his body and says she loves him just before the last rose petal falls. A transformation takes place and the Beast is alive and human once more. Though Belle does not recognize him at first, she looks into his eyes and sees the Beast within and they kiss. The two sing of how their lives have changed because of love and they dance once more as the company, now changed back to their human form, gathers in the ballroom ("Transformation/Finale"). Yasmin was excited to hear that her first production acting with Michi would be Beauty and the Beast. It was such a romantic story, at least in her eyes. To her, it was probably one of the first Disney cartoon films that showed a strong, independent princess. Snow White was overtaken by an apple. Aurora had to wait around until a guy kissed her before her life began. But Belle on the other hand defiantly read books, refused advances from the superficial town hero, faced down and refused to eat with a horrific beast, fought off feral wolves, ventured out alone to save her father, and a myriad of other feats. Romantic story, strong independent female, and an odd-looking creature. If that couldn't sum up Michi and Yas, she didn't know what would. Like some of her fellow cast-mates, Starbuck thought Beauty and the Beast was a beautiful love story and inspiration to young girls everywhere. She was so excited for her debut role that in the weeks leading up to the show, she could often be found rounding up any number of family members for extra practice outside the theater. They made use of apartment stairwells and rooftops as their makeshift stage, rehearsing so often that even the children had started memorizing lines and songs so as to join in the fun. But nothing compared to Opening Night, belting out the songs she knew so well on a real stage, in front of a real audience. This is when Starbuck Jones truly came to life. Can Be Found: BFF HQ. Writing music at her Seaside residence. It's really, really easy to go around practicing your lines when your long-time girlfriend is part of the cast as well. Michi may be used to performing on stage, but never as much of a character! Backstage she could be seen doing her best to prepare for her role while sporting a rather nice diamond on her ring finger. Maggie was behind the curtain helping her brother get over the stage jitters. "I know this is your first time in a big play, but it'll be ok. Everybody out there had a first night in a big show, too! They'll help you." "Are you sure?" Rick asked as he eyed up his sister. "Richard Dennis Harker, Jr. I'm your big sister. I've always stood between you and bad things. Nobody out there is a bad person, nobody out there will make fun of you. And if they do, I'll punch 'em in the nose!" Rick laughed and headed for the stage for the scene where Belle met the household staff. "We're doing Beauty & the Beast next... a good chunk of the chorus and main cast will be people transformed into animated household objects, as well as the titular Beast." Mataya had smiled across the desk at Raul, a hint of challenge in her look. "Costuming is handling most of it; you'll help some with that, but I really need you to focus on turning Josh into the Beast." The half-dwarf raised an eyebrow back at her. "I'm not familiar with the show, but in the folk tale, doesn't the Beast eventually turn back into a prince?" "Yep. So we need something that can be quickly removed. We can use magic if we have to, but I'd like to keep as much physical make-up as possible. Think you're up for it?" A matching smile spread across Raul's face. "Just watch me." In the end, they only needed an adhesive enchantment on the cowl to keep it in place for the Beast's mane and horns, which fell away with a whispered word from Josh while Anya--as Belle--was sobbing over him. The fangs were also easily removable, so that from the audience's perspective, it was a seamless transition live on-stage. Lumiere was certainly not the starring role, but that never mattered to Eregor. He was having fun with it, and "Be Our Guest" was a fantastic show-stopper towards the end of Act 1. Part of it was playing opposite Yasmin as Cogsworth, as they had been in enough shows together that they knew each other's habits and oddities fairly well... the other part of what made Lumiere so fun is that he was, as Eregor put it to Rhi once, "so gloriously French." Saila could scarcely believe that it was her third season with the Shanachie. The mercurial teen could scarcely believe that it was her third season at anything. She marveled at the fact that there were more friends now than strangers among the staff, that even though neither Sabine nor Craig had accompanied her into her third season, she didn't feel lost or confused about almost anything anymore. The theater had become one of the few constants in her strange little life, as much a part of her as Hex or her wolves. No longer just a child flying by the seat of her pants, winging it as she went along, Saila had truly become an Actress. She'd found a semblance of home. "I'm a... tea pot," the girl had murmured as she pored over her script, flipping the pages until she'd found her feature song. "That's new." She had reassuring smiles for their newest cast members, and perhaps most especially the young boy who was playing her 'son'. 'Guess what, Babe?' she'd told Hex when she got off rehearsal one night, a playful smile on her lips. 'It seems I have a son now.' Saila thought she might never get tired of giving her 'Ol' Man' periodic heart attacks like that. Hex. Her thoughts turned inevitably to the Hellion as she memorized the words, working her way through the new choreography. She thought about their life together so far, the adventures they'd been on, the new decisions they'd so recently made. She thought about the jokes they'd shared, the nicknames they'd given each other, and every time she sang the show's most famous song, it was his smile she so could so-clearly see in the back of her mind. Can Be Found: Can he? Playing foil to Dorian's Gaston was nothing short of delightful for Asher. Between the live action movie, animated film, and the Broadway version, he had plenty of source material from which to draw inspiration when bringing Lefou to life. He was somewhere between Jesse Corti's Lefou and Josh Gad's Lefou but what he eventually settled upon was vibrant and comical, paired with plenty of back stage shenanigans with the rest of the cast. "There are only two things. Truth and lies. Truth is indivisible, hence it cannot recognize itself; anyone who wants to recognize it has to be a lie." Determined to make her first role (and starring one at that) a success, Anya spent hours upon hours in learning her lines and practicing her songs. She thought it might be challenging to slip into the role of Belle, but channeling her fierce independence and ability to see through the surface of people helped her to find that piece she needed to make a command performance. Of course, it helped that her co-star was handsome regardless of any makeup made to make him otherwise. She hoped that the audience got past her youth and inexperience and was appreciative of the effort she put into her performances. Anya was truly happy to have such faith placed in her, and did not want to let any member of the cast or the theater or the audience down. Regardless, this was an experience that the young woman would treasure forever. He knew he wasn't given the role due to any lack of talent at the theater. There was tons of that to go around and then some. But Josh could only perform a few times a year, and though he had other responsibilities and obligations now, it had always been his dream to become a musical theater performer. It was what he'd spent his whole life working toward, despite his father's political ambitions for his youngest son. It was the first time Josh had been given a leading role since playing Danny Zuko in Grease, which had been a blast, but playing the Beast was a much different role from most of those he'd done before. It was much more serious, and though he only had one solo, Josh was determined to give it everything he had. Of course, he had to rely on the makeup and costume departments to transform the handsome, young prince into a beast, but the rest - the voice, the angst, the anguish - was all Josh. If I can't love her, then who?